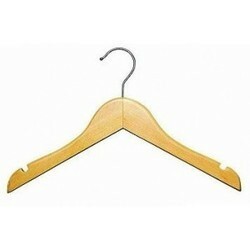 Our product range includes a wide range of wooden clip hanger, wooden hanger with bar, smart garment wooden top hanger, wooden hanger with clips, trouser wooden hanger and garment wooden hanger. 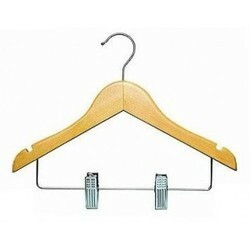 The ingenious design of this wooden hanger makes it a smart choice for hanging suits. It has slanted arms designed to be gentle on delicate suit shoulders. Notice the notched shoulders, perfect for hanging straps and security loops. The classic chrome swivel hook, satin lacquer, and sturdy wooden pants bar are all top quality, designed to last you a lifetime. The flat body design helps you to save space in your closet without sacrificing quality, style or strength. 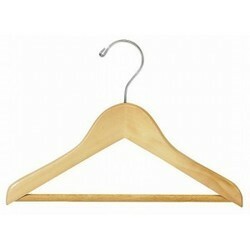 Your suits will be easy to keep organized and looking fantastic with these versatile wood hangers. The ingenious design of this wooden hanger makes it a smart choice for hanging tops. It has slanted arms designed to be gentle on delicate fabrics. Notice the notched shoulders, perfect for hanging straps and security loops. The classic chrome swivel hook and hard satin gloss coat are top quality, designed to last you a lifetime. You will never have to deal with splintered wood or bent hooks again. The flat body design helps you to save space in your closet without sacrificing quality, style or strength. 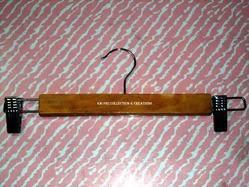 The ingenious design of this wooden hanger makes it a smart choice for hanging anything from camisoles to suits. It has slanted and notched arms to hold tiny straps and prevent stretching. The classic chrome swivel hook, satin lacquer, chrome bar and clips are all top quality, designed to last you a lifetime. The ability to coordinate outfits and the flat body design helps you to save space without sacrificing quality, style or strength. Your closet will be easy to keep organized and looking fantastic with these versatile wood hangers. This dark walnut stained wooden pant and skirt hanger is designed with organization in mind. The industrial grade lustrous chrome clips are meticulously manufactured not to damage clothing. The pads hold your finest pants and skirts securely, yet gently, without staining, snagging, or imprinting the fabric. The hanger body is flat so that you can hang all of your pants and skirts closely together, saving space and giving your closet that uniform look you've been dreaming of. The polished chrome swivel hook and hard satin coat are also top quality, designed to last you a lifetime. 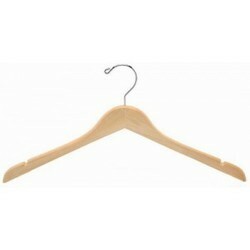 These wooden hangers are a must-have in any closet. 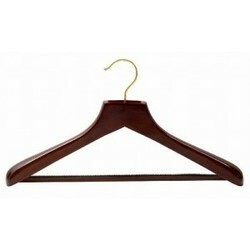 This satin suit hanger has a 2" wide, thick, dark walnut stained, wooden body that makes this, the ultimate in suit hangers. You'll love the support that the thick, curved design gives to your suits' shoulders. No more sagging or puckering. The pants bar is also a dream come true! The vinyl coating over the wooden bar keeps pants from slipping without using any special hooks, clips or attachments. The lustrous brass swivel hook has an open design to give your closet a unique flare. 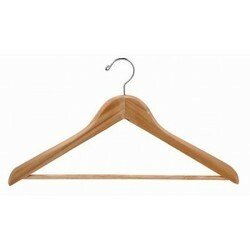 Everything used in the manufacturing of this wooden hanger is top notch to ensure a lifetime of indulgent use. Finally! An affordable, top quality luxury hanger made with no chemical preservatives or varnishes from American grown aromatic red cedar. 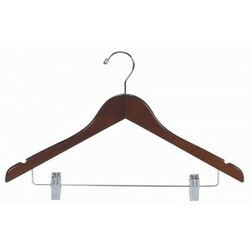 This cedar suit hanger features a curved design for protecting the shape of your finest suits. Manufactured with an industrial grade polished chrome swivel hook and solid cedar pants bar for draping slacks. This hanger is definitely designed to last you a lifetime! You'll love enjoying the benefits of aromatic cedar in your closet. Cedar is naturally rot resistant, absorbs odor causing moisture, deodorizes the air, and repels pests away from your closet. The ingenious design of this dark walnut stained wooden hanger makes it a smart choice for hanging anything from camisoles to suits. It has slanted and notched arms to hold tiny straps and prevent stretching. The lustrous chrome swivel hook, satin lacquer, polished bar and padded clips are all top quality, designed to last you a lifetime. The ability to coordinate outfits and the flat body design helps you to save space without sacrificing quality, style or strength. Your closet will be easy to keep organized and looking fantastic with these versatile wood hangers. This outfit hanger is great for hanging tops and bottoms together. Save space or use these kids' hangers to coordinate separates for the week. The small, 11" width helps you to avoid stretching out the necks of children's clothes. These kids' hangers are made of light beechwood and coated with multiple layers of hard satin lacquer. Notched shoulders are great for small straps and security loops. The industrial grade chrome swivel hook, no-snag rubber padded clips, and overall quality construction ensure that these affordable children's hangers will last a lifetime. The perfect addition to any child's closet. 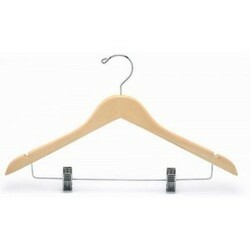 This children's suit hanger is great for helping suits to keep their shape. The small, 11" width helps you to avoid stretching, tearing, or deforming the shoulders of small kids' suits. These children's hangers are made of light beechwood and coated with multiple layers of hard satin lacquer. The industrial grade chrome swivel hook, sturdy solid wood pants bar, and overall quality construction ensure that these affordable children's hangers will last a lifetime. The perfect addition to any child's closet. This children's shirt hanger is great for hanging coats and tops. Save space with this flat hanger design. The small, 11" width and slanted shoulders help you to avoid stretching out the necks of children's clothes. These kids' hangers are made of light beechwood and coated with multiple layers of hard satin lacquer. The industrial grade chrome swivel hook and quality construction ensure that these affordable children's hangers will last a lifetime. Notched shoulders are great for small straps and security loops. The perfect addition to any child's closet.